As Labour MP for Gloucester, when things were good for Parmjit Dhanda they were very good. He was rolled out for Labour conferences and media appearances as a poster boy for the party a shining example of a new Britain, where white constituencies chose ethnic minorities as their candidates and then elected them as their MPs. It was the ultimate political fairy tale. However, the other side of Parmjit's story remained hidden for years. Its exposure threatened to undermine the received political narrative and neither Dhanda nor his colleagues were comfortable addressing the issues it would inevitably bring to light. Then something life-changing happened. As Parmjit and his family strove to remake their lives in the wake of Labour's general election defeat, there came a knock on the door of their Gloucester home one Sunday morning. A frightened-looking lady stood there shaking and distressed, her dog pulling her by its lead towards one of the cars parked outside. In the middle of the drive was a pig's head. To experience this kind of racism so close to home and so close to his young family left him feeling demoralised and isolated. After Parmjit's nine years of service to the local area, the perpetrators hadn't even realised the difference between a Sikh and a Muslim. 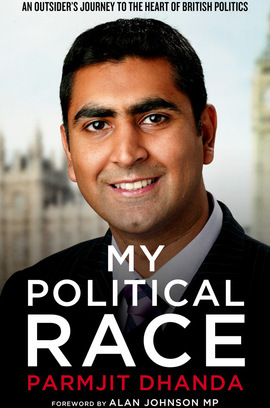 Comprising unique insights, witty anecdotes and thought-provoking critique, this is the extraordinary tale of how a 'foreigner' in the Westminster village upset the odds despite Britain's failure to address issues of race within its own Parliament. Speaking out for the first time about the uncomfortable truths he faced during his time in politics, Parmjit Dhanda hopes he can help present a smoother path for others in the future, as well as encouraging those currently in the game to speak out for themselves. Whether you’re interested in politics or not, read this book. With the barriers he’s faced it’s amazing that Parmjit Dhanda ever got selected and elected to Parliament. This story is about triumph, but also about the uncomfortable truths ethnic minority politicians are faced with but rarely talk about. Until now. Parmjit Dhanda is a unique witness to the dramatic changes taking place in Middle England. One of the few minority Labour MPs ever to sit for a largely white constituency, his experience at the forefront of rapid social change provides an exceptional perspective on the future of our country. His book offers us a rare glimpse into the challenges of politics outside the Westminster bubble.